Performance Metal Roofing | Flashing Repairs | ME and NHPerformance Roofing, Inc. 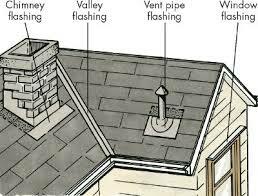 If there is a leak around your chimney you’ll most likely need flashing repair. It may be that the flashing around the chimney is inadequate, worn, corroded, or that it was improperly installed in the first place. Do not use caulk to repair these flashings! Whenever it’s practical to replace damaged roof flashing, have your professional Performance Metal Roofer do so. Roof repairs are, unfortunately, all too common. Many things can lead to the need for a roof repair, but the most common are leaks, weather wear and tear and tree limbs. Repairs can also be necessary as a result of poor installation, malfunction, or age. Where pipes like plumbing and heating stacks pass through roofs and exterior walls. Where windows and doors are connected to openings in exterior walls. Where exterior walls and roofs me (dormers, for example). Flat roof perimeters and connections. Leaks happen to roofs primarily as they age, but can also be caused by poor installation. Leaks can cause damage not only to your roof, but also to the interior of your house. They’re most commonly found around openings such as skylights, chimneys, dormers and roof/wall intersections. Leaks in these places are commonly caused by worn or poorly installed flashing. Why Maine and New Hampshire Should Hire Us for Flashing Repairs Repairs?